Our Organization Nav Aastha Jan Vikas Seva Samiti is an state level NGO. 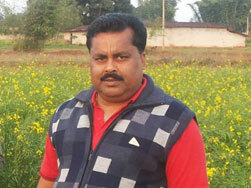 It has 3 years of experience in Dairy Sector. It had worked in many sectors like educational trainings, Capacity building, Pando Vikas Abhikaran, Tribal Welfare & SGSY, SHG forming, grading & trainings provided by the Government of Chhattisgarh in many Districts. The work in dairy sector are : Integrated Dairy Development Project, Jashpur, Surguja & Korea District & SGSY projects in Raigarh, Surguja, Balrampur Districts. The organization is working in Forest Department Under the DFO in Dharamjaigarh, Jashpur, Korea, Surajpur, Surguja, Manendragarh, Raigarh, Korba, Dhamtari, Balrampur. But if a teacher commits mistake, a man's 6 generation become illiterate." Also we have a aim to start a school for the betterment of children, and a talent research centre for the youth and school for illiterate women separately for the betterment of one and all in educational field. We have aim to work in very big level in Dairy sector that is done mainly to save the cattle and cow killing and their trafficking because as the people will know their value they'll not try to kill them but to use them for their need. We have aim to open a free hospital for the BPL and PTG families especially for heart patients and Diabetes patients.